There are new colors for Apple Watch bands and iPhone cases too. If Apple’s strategy this week is to build excitement for next week’s “Show time” event, then it’s doing a bang-up job. Following Monday’s iPads and Tuesday’s iMacs, Apple updated another popular product today with the launch of the second-generation AirPods that bring a new chip, new features, a new case, and more convenience. The new AirPods look exactly like the first-generation model, but include several key enhancements. The biggest is the addition of a new H1 chip, which Apple says was “developed specifically for headphones, delivers performance efficiencies, faster connect times, more talk time and the convenience of hands-free ‘Hey Siri.’” That means you no longer need to tap your ear to get Siri’s attention. The H1 chip is another in a long line of custom silicon from Apple, including the “A” series in iPhones and iPads, the “S” inside the Apple Watch, the “T” security chip, and “W” wireless chip for easy Bluetooth pairing. According to Apple, the H1 chip features improved syncing and delivers up to 50 percent more talk time as compared to the first-generation Airpods. 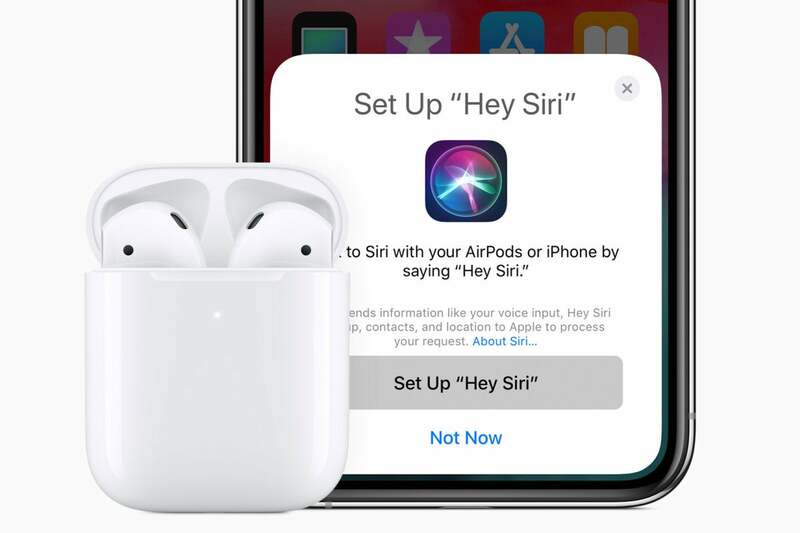 It also allows for improved switching between devices as well as the always-on “Hey Siri” support for simple commands, such as skipping tracks, making calls, raising the volume, and getting directions. Along with new AirPods, Apple is finally selling the wireless charging case that was announced in 2017 along with the still-missing-in-action AirPower wireless charger. The new case costs $79 on its own and works with the original AirPods, but new buyers can get it for $40, bringing the full cost of the headphones to $199. The standard version of AirPods without the wireless case remains available for $159. In addition to the second-generation AirPods, Apple also announced new Apple Watch bands in the usual assortment of spring-inspired colors, as well as a handful of matching iPhone XS and XS Max cases. Wednesday’s AirPods announcement continues an uncharacteristically rapid-fire release schedule this week. Never has Apple unveiled so many products in succession, and with the “Show time” event looming next week, the timing is especially curious. While none of these products necessarily fit with the theme of the event—which is expected to focus on Apple’s new video streaming service—it’s not uncommon for Apple to quietly update its store during big events with products that don’t make the main stage. Clearly that’s not happening this time. Why this matters: AirPods are rapidly becoming one of Apple’s most popular products, and this update only widens the gap between it and its competitors. While the new generation doesn’t include features like noise reduction and water resistance, Apple leaves the door open for another release later in the year by conspicuously not using the name AirPods 2.